In recent years, there have been organized efforts across the country to pass laws recognizing gold and silver as money. So far, there hasn’t been any success on the national level, but efforts at the state level have been more positive. In fact, one state was recently able to get a legal tender law passed. This means gold and silver are now legal forms of money in this state. Let’s look at where this law passed and what it means for you and other precious metal owners. In May 2017, Arizona Governor Doug Ducey signed HB 2014 into law. This means that in the state of Arizona, precious metals, such as gold and silver, are now legal tender. 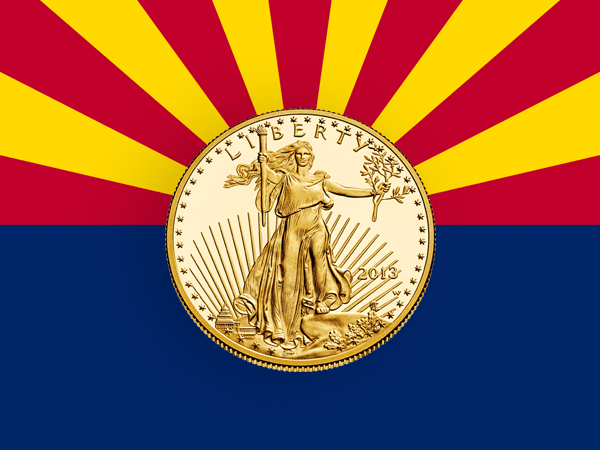 HB 2014 defines gold, silver, and other precious metals as legal tender and exempts them from capital gains taxes, thus allowing Arizona residents to use precious metals instead of Federal Reserve notes. Dr. [Ron] Paul testified before the Arizona Senate Finance Committee in support of the bill in March. “Every supporter of free-markets should cheer Arizona’s passage of HB 2014. There is no more justification for forcing individuals to use government-created money than there is for forcing them to drive government-manufactured cars. In fact, as the Federal Reserve’s 114 years of failure shows, giving monopoly control over our money supply to a secretive central bank is the most dangerous form of government intervention,” said Dr. Ron Paul. Fortunately, Arizona is not the only state that recognizes gold and silver as money. In 2011, Utah became the first state in recent history to formally recognize gold and silver coins as legal tender. And on June 4, 2014, Oklahoma passed a bill recognizing gold and silver coins issued by the United States government as legal tender. While not as broad in scope as Arizona’s law, it’s still a step in the right direction. And now, other states are also starting to make the move in this direction. That last sentence might be the most important. Under civil asset forfeiture laws, cash can be seized by police without any formal charges being brought against you. All they need is suspicion and they can take your money and run. But the Texas law appears to exempt gold and silver from civil asset forfeiture. That, plus the ability to convert gold and silver back into dollars without paying any taxes, fees, or penalties, would be a huge incentive for Texans to convert dollars into precious metals. What began with Utah in 2011 and has continued with Arizona in 2017 could be the beginning of a massive change in how states treat gold and silver. Every state that recognizes gold and silver as money opens the door to another state doing the same. But keep in mind, as state laws change, demand for gold and silver will naturally increase. And this demand could push gold and silver prices higher. Could state laws eventually force the federal government to formally recognize gold and silver as legal tender while exempting them from capital gains taxes? It might seem far-fetched today, but it’s not outside the realm of possibility. And if that happens, watch out… almost everybody will be interested in owning precious metals.